Have you ever received an invitation to a wedding or and not known how to dress? If preferred dress is not stated on the invitation, how do you know what to wear? Whether you realize it or not, the invitation holds TONS of subtle clues: you just have to know what to look for. 2) How many envelopes? 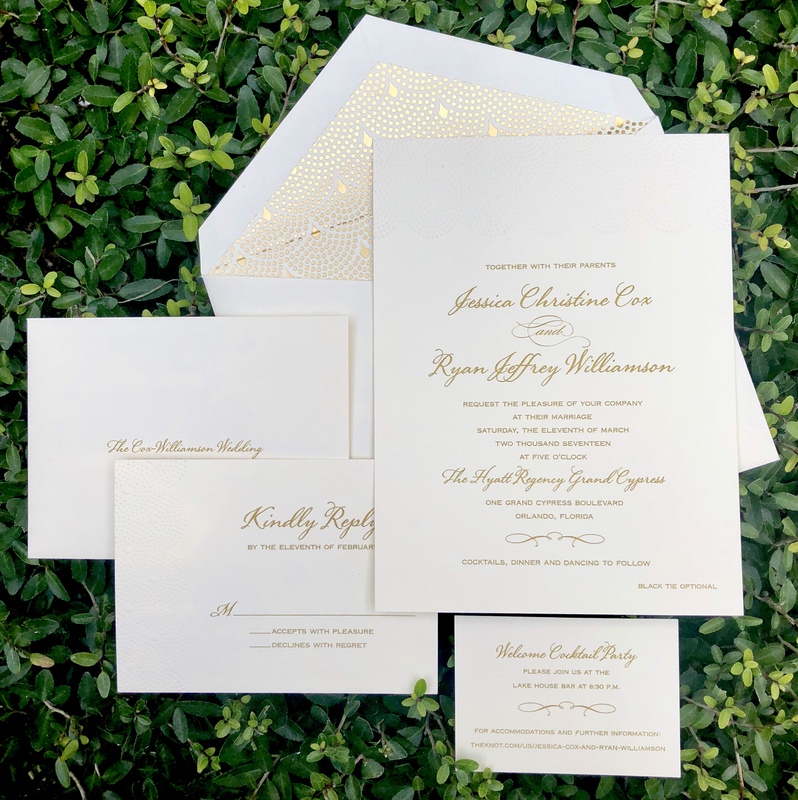 If a wedding invitation arrives with an inner AND outer envelope, this is a subtle sign that the event is traditional and likely more formal. If there is a piece of tissue paper on top of the invitation, well, that’s about as formal as it gets. 3) Script/Color: If the script is casual and in an informal color, for example, Turquoise, you can expect the affair to be more casual (likely a beach wedding) where your “Sunday Best” would be appropriate. If the script is very formal (think dramatic cursive) in a bold color such as navy, black or gold, you can expect it to be a black tie event. 4) Language: Whether or not you realize it, language is very suggestive. “Request the honour of your presence” is on the most formal and traditional side of the spectrum, while “Please join us for a wedding and celebration honoring…” is quite the opposite. 5) Setting: Is the ceremony at a church and the reception at a country club or similar type venue? (Translation: traditional, cocktail attire at the least.) Perhaps it is on a farm with the reception in a barn. (Not joking … there are infinite possibilities here!) In this case, you have a little more free reign to be creative with your wardrobe. I’ve worn cowboy boots with a cocktail dress to a wedding before and not only was it very appropriate, it was very comfortable! 6) Time of day: Add up all of the above information and take note of the time of the event. Anything after 5:00 is usually considered “cocktail attire”, but factor in the other clues to determine if the dress code is more or less formal. Tie or no tie – the recurring question: Every time we go to a wedding, my husband asks me and calls about 5 other guests to determine whether or not he should wear a tie. Let’s make this simple: yes. Just wear the suit with a tie. You can always take your jacket off for a more informal look and feel if you’re uncomfortable or feel overdressed at the reception, but this is a special occasion and it’s best to heir on the side of caution. A tie implies you’re taking the event seriously, not treating it like another day at the office. To Include the information on the invitation or not? That is the burning question. 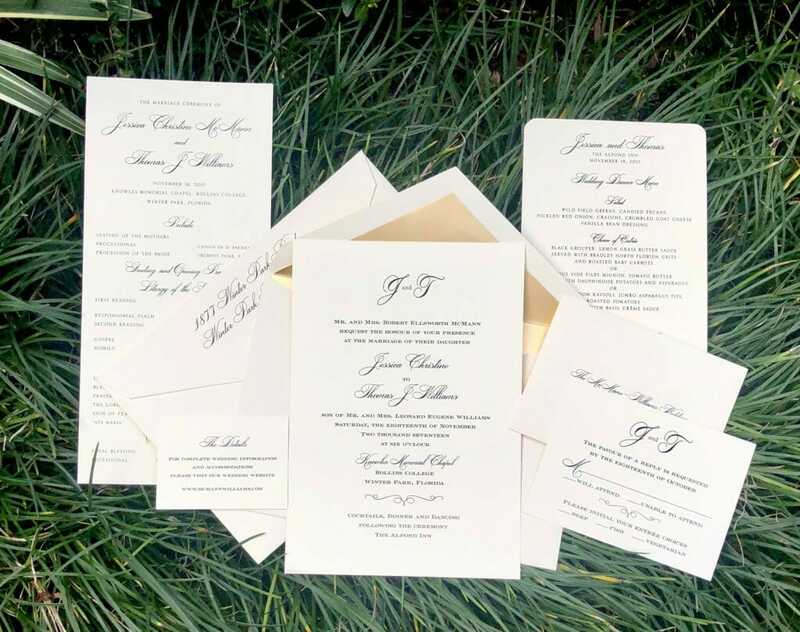 As stationary consultants, brides often ask us, “should we include information on the attire we expect?” Often times, people don’t want to “clutter” their invitation with this type of information and also trust that people should have good enough judgment from the style of invitation to interpret what should be proper attire. Unfortunately, it’s not always that easy and people don’t always use the same (good) judgement when trying to “decode” an invitation. Expect tons of questions from guests about what to wear, and people who inevitably under dressed. If you’re not willing to take your chances and bet everyone is capable of interpreting all of your subtle clues: include the information. If not on the invitation, (which is your safest bet), then include it on the information insert card, website or wherever else makes sense. Thank You Notes: Know When to Mail ‘Em – And When to Hold ‘Em!